Rep. Dwight Evans accepts the Edward Donley Education Policy Leadership Award from EPLC President Ron Cowell. 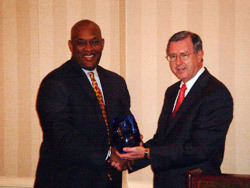 On October 21, 2009, The Education Policy and Leadership Center honored State Representative Dwight Evans with the Edward Donley Education Policy Leadership Award at the Center’s annual awards reception. Representative Evans was elected to the Pennsylvania House of Representatives in 1980 and has served as the Democratic Chairman of the House Appropriations Committee since 1990. Prior to his election as chair of the Appropriations Committee, he served as a member of the House Education Committee. He represents the 203rd legislative district in Northwest Philadelphia. Throughout his legislative career, education finance and equal opportunities for students have been a focus of his work. Shortly after becoming chair of the Appropriations Committee, Representative Evans cooperated with the House Education Committee to commission a study of K-12 education funding in Pennsylvania by the National Conference of State Legislatures. During the past two years, his leadership in the Legislature was critical to the progress made toward reforming Pennsylvania’s system of K-12 education finance. Working with Democratic and Republican governors and legislative colleagues, Representative Evans also has played a major role in the consideration and enactment of many other significant education policies pertaining to early intervention services for young children; Pre-K funding; charter schools; academic standards; post-secondary education opportunities; the Philadelphia School Reform Commission; and much more. Representative Evans has been a much respected voice in national discussions about important education policy issues. He participated in a White House roundtable discussion about education with former President George Bush and has spoken about education policy before the Brookings Institution and the National Press Club. For several years he served as a member of the board of directors of the National Assessment Governing Board. Representative Evans earned his Bachelor’s Degree from LaSalle University and his Associate’s Degree from the Community College of Philadelphia. He was awarded an honorary Doctorate from Lincoln University. The Center also recognized with the EPLC Partner Award the Public Citizens for Children and Youth (PCCY), the Pennsylvania State System of Higher Education (PASSHE), and the U.S. Army War College. Public Citizens for Children and Youth (PCCY) has been a very important partner to EPLC, often participating in EPLC policy programs during the past ten years, and for several years working with the Education Funding Advocacy Group convened by EPLC. During the past two years, as a key partner with EPLC and other organizations working together as the Pennsylvania School Funding Campaign, the staff of PCCY made major contributions to the development of funding reform advocacy goals and strategies; media outreach; the development of legislative and community-based champions; and grassroots public advocacy. They were particularly key to the successful advocacy work in Southeastern Pennsylvania that has led to very significant progress toward state K-12 education funding reform. PCCY was founded more than 25 years ago to help improve the lives of children by advocating on their behalf and being a catalyst for positive change. PCCY works to help children by advocating for improvements in healthcare, childcare, families, communities, and public education. They work to increase the adequacy and equity of funding in schools, to improve learning opportunities for all children, to improve school climate and personal attention available to children, and to increase opportunities for children to be engaged in the arts and successful in school. The Pennsylvania State System of Higher Education (PASSHE) has played an integral role in EPLC’s Education Policy Fellowship Program for eleven years. The Chancellor’s Office at PASSHE has generously provided space for the Fellowship Program sessions, providing a comfortable setting and significant financial savings for EPLC and the Program. The support of the Chancellor’s Office and the staff of PASSHE continues to enable EPLC to make available this premier professional development opportunity at a reduced cost to all participants. With this support, the Pennsylvania Program has consistently been for several years the largest program among the states constituting the national network of the Education Policy Fellowship Program. PASSHE, with 14 universities and more than 112,500 students, is the largest higher education provider in Pennsylvania. PASSHE’s mission is to increase the intellectual wealth of the Commonwealth, to prepare students at all levels for personal and professional success in their lives, and to contribute to the economic, social, and cultural development of Pennsylvania’s communities, the Commonwealth, and the nation. For the past eight years, the Education Policy Fellowship Program of EPLC has had the exceptional advantage of a unique partnership with the U.S. Army War College. Every year, the Pennsylvania Fellows have spent a day at the Carlisle Barracks where they have learned from the College staff about strategic leadership concepts. This year, Pennsylvania Fellows and teams from Washington D.C. and four other states had the opportunity to meet together at the College as part of a pilot and highly successful Regional States’ Leadership Forum. The Pennsylvania Fellowship Program also has been enriched each year by the participation of two or three staff from the College’s Department of Command, Leadership, and Management. In addition, the Center presented the EPLC Leadership Program Alumni Award to James Buckheit and Dr. Mary Frances Archey. Jim Buckheit graduated with the 2004-2005 class of EPLC’s nationally-recognized Education Policy Fellowship Program and remains an active member of EPLC’s statewide Leadership Network. He has generously given of his time whenever asked to serve as a resource for various EPLC policy and leadership programs. Since September 2009, Jim has served as the Executive Director of the Pennsylvania Association of School Administrators. In this position, he works to promote high quality public education systems for all learners in Pennsylvania through the support and development of professional leaderships. From 2003 to September 2009, Jim was the Executive Director of the Pennsylvania State Board of Education. During his tenure with the board, the regulations that govern teacher certification, student attendance, student rights and responsibilities, student services and higher education were rewritten. The board has also published new state academic standards, approved policies necessary to implement provisions of the federal No Child Left Behind Act and conducted a validity study of the Pennsylvania System of School Assessment. Throughout his 29 years of service to the Commonwealth, Jim has led numerous statewide education, youth community service and workforce development initiatives while serving in a variety of leadership roles in the Department of Education and the Department of Labor and Industry. He has served as Director of School Services; Director of Community and Student Services; Coordinator of Dropout Prevention and Service-Learning Programs; Director of the Youth, Education and Service Unit; and Chief of Planning and Evaluation for Job Training Programs. Jim earned a Master’s Degree in Public Administration and a Bachelor’s Degree in American History/Political Science from Long Island University. Dr. Mary Frances Archey graduated with the 2002-2003 class of EPLC’s nationally-recognized Education Policy Fellowship Program. She is a regular participant at EPLC policy programs in Western Pennsylvania and a consistently supportive voice for the work of EPLC and the Fellowship Program. Mary Frances is currently the Vice President for Learning and Student Development with the Community College of Allegheny County (CCAC). She has worked at CCAC since 1986 in various roles including Interim Senior Vice President for Academic Affairs/CEO of South Campus, Dean of Arts and Sciences, Dean of Business and Accounting, and Dean for Liberal and Fine Arts and Business. Prior to her arrival at CCAC, Mary Frances was the Dean of Students with West Virginia Northern Community College and Assistant Professor of Sociology with West Liberty State College. During her past few years with CCAC, Mary Frances has implemented the Achieving the Dream Program to enhance student success, designed a faculty resource program to enhance student engagement with faculty and staff, and integrated academic and student affairs in the areas of career services and curriculum advisory boards, among other activities. Mary Frances is a Zenger Miller authorized trainer in Total Quality Management for Education. She is also a National Board Certified Counselor. Mary Frances earned a Doctorate in Higher Education Administration from West Virginia University, a Master’s Degree in Social Science Education from the Indiana University of Pennsylvania, a Bachelor’s Degree in Social Science Education from the University of Pittsburgh, and a Professional Certificate in Human Resources Management from Penn State University.